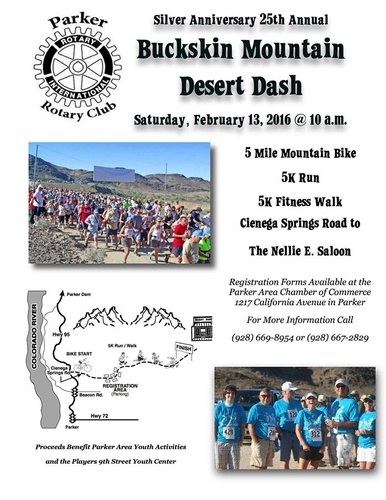 "25th" Annual Buckskin Mountain "Desert Dash"
5 mile mountain bike / 5k run / 5k fitness walk out to the Nellie E Saloon (aka The Desert Bar). All entrants eligible for prizes. The course will be closed to all non-authorized traffic from 9:45 to 11:00am. Transportation will not be provided from the Nellie E. Saloon finish line back to parking area. Drawing: All Entrants Eligible. Must be present top win rain or shine! No refunds. Registration begins at 8:00 am - 9:45 am.